Since 2008, over 5-and-a-half million homes have been foreclosed on. In fact, in this same time period homeowners have reported losses in excess of $104 million dollars with the average loss around $3,500 per household. These companies have targeted everyone – no matter their age, education, income, or community. Even deployed military and their families are targets! The bottom line is that anyone who struggles with their mortgage payments is at risk. In 2009, Congress asked NeighborWorks® America, to launch a national public education campaign to protect homeowners. 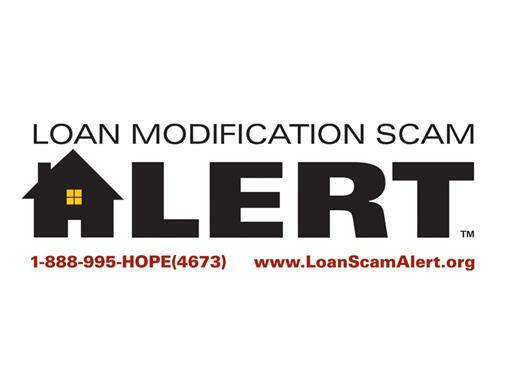 The Loan Modification Scam Alert Program works closely with various federal, national and local partners to identify scams and provide consumers with trusted and reliable resources. The challenge is that as methodologies and tactics evolves, we all become more vulnerable to scammers. The Loan Modification Scam Alert program is constantly identifying new and emerging scam trends. The Loan Modification Scam Alert Program has had success in exposing scams and providing consumers with a method for reporting scams. We've been able to reach millions through television, radio, and social media. • Information is available in English, Spanish, Haitian Creole, Chinese, Korean, and Vietnamese. • Call 1 888-995-H-O-P-E (4673) to report a scam or talk to a housing counselor. There's no cost. Let's stop these scams once and for all and ensure that no family needlessly loses money when assistance is free!